Prepared on Notepad by Ian Smith, This page created 16th March 2015, updated 29th November 2017. Best on 800*600. DAF's prototype for London was shown at the NEC Bus & Coach Show in 1999, then came as a demonstrator to Arriva London in June 2000, where it was tested over the 184 route from Palmers Green. It then went on demonstration duties, still on trade plates, to Airlinks at Heathrow and First Beeline at Slough. 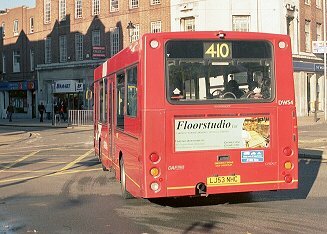 It came back to store at Palmers Green, before being registered in August 2000 and given fleetnumber CW 1. It went into service in September, on the 184 but from the normal route garage of Wood Green. It stayed there until June 2001, working alongside other types, then moved to Brixton as a trainer, in preparation for the arrival there of production Cadets on the 319. The trainer role continued, CW1 moving in December 2001 to Enfield before the arrival there of the second batch for the 313. CW1 returned to Wood Green in spring 2002, initially as a trainer before the third batch went there for the 184. 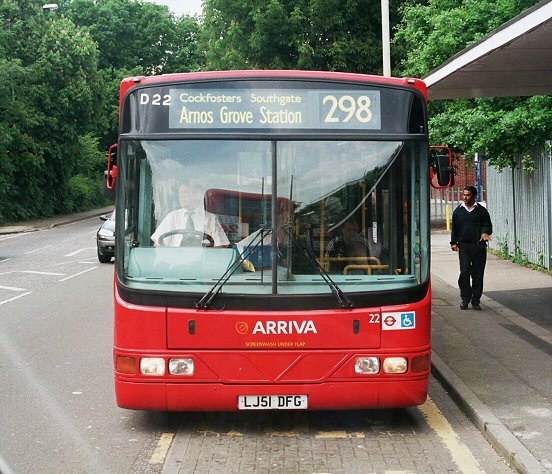 As the production buses arrived it resumed bus duties on the 184, and stayed at Wood Green until December 2006. Then it went on long term loan to Arriva Southern Counties, initially at Dartford and Grays. It retained red livery, but was numbered 3975. 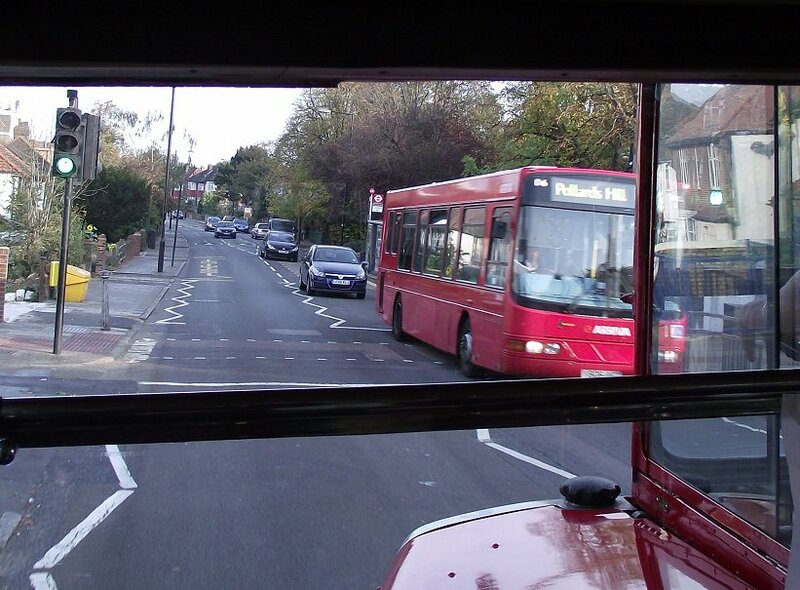 It was used to add capacity to route 498 (Romford - Brentwood. It returned across the river to Dartford in January 2008, and was used on the 428 (Erith - Bluewater). In June it was loaned to Arriva the Shires at Garston, where there was a temporary(?) 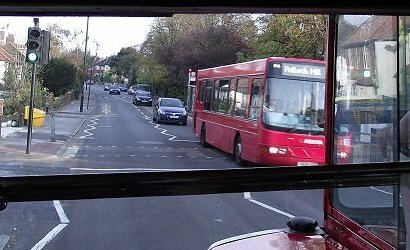 shortage of red buses for TfL work. I was used on the H18/H19. It returned to Dartford at the end of August, in time for the new school year. 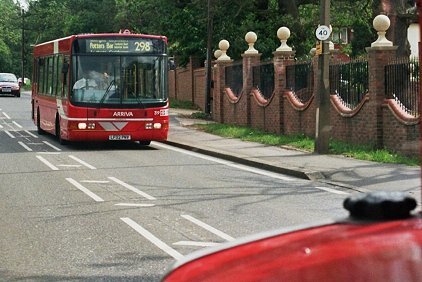 The i-Bus system arrived at Dartford in spring 2009, and after 3975 played its part at Dartford as a spare for the fitting to other buses it was despatched south-westwards to Arriva Guildford & West Surrey at Horsham, where it was a TfL spare for route 465 Dorking - Leatherhead - Kingston. The summer of 2009 saw the wanderer off again, on loan once more to Garston from late July. It returned to Southern Counties at Warnham in September, only to be sold to Metrobus when the Warnham / Horsham operation, including route 465, was sold to them in October 2009. Metrobus did not use it, but sold it off to North Somerset Coaches in December, still in Arriva London red livery. 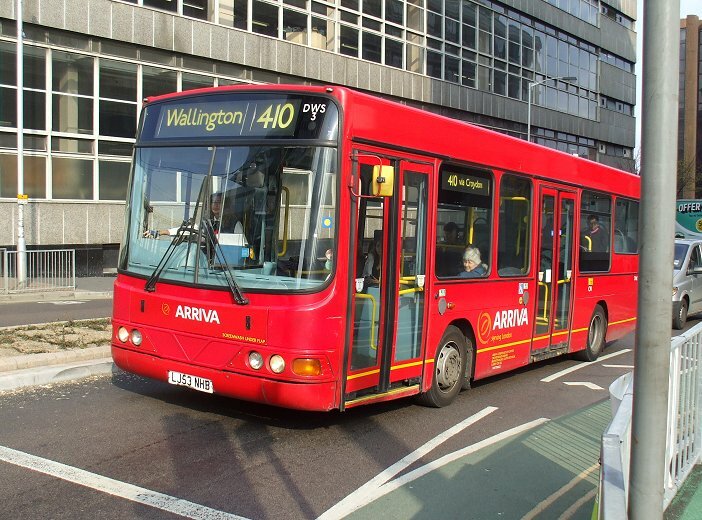 Arriva London's first batch of production Cadets were 10.2m long, and arrived at Brixton garage between August and November 2001. They were put into service on the 319 (Streatham Hill - Sloane Square). Numbered DWL1-22, they quickly acquired numbers D1-D22 high on the front panel beside the destination indicator, and on the rear. In February 2003, due to increased stock at Brixton, the DWLs were outstationed at the old Brixton Tram Shed, with maintenance still at Telford Avenue. DWL15 was given an overall ad in blue for Oyster cards, which it wore from June 2004 to January 2005. The batch continued on the 319 until September 2006. DWL9 moved to Croydon, where it worked on the 407, as here in April 2007. DWL6 also moved from Brixton to Croydon, then later on to Thornton Heath where its usual route was the 255, as here in October 2011. DWL13 and 14 moved to Enfield to help out on route 313, which was experiencing problems. They made occasional forays on the 491. DWL15, 16, 17, 20, 21 and 22 went for refurbishment, following which they moved to Arriva London North to join their cousins at Wood Green (WN), Enfield, WN, Edmonton , WN and WN respectively. DWL18 spent a few months at Croydon before heading north to Wood Green. Arriva London North: DWL22 (WN) on the 298 at Cockfosters, heading for Arnos Grove Station in May 2007. DWL17 (EC) on the 444 at Chingford, February 2012. Both were in unadorned red. DWL19 went walkabout, going first on loan to Dartford, ostensibly to help out on red route 160, acquiring an Arriva Southern Counties number (3974) for the duration. It spent some time over the River at Grays, then returned to Arriva London at Edmonton in June 2007 before going on loan to Arriva the Shires at Garston, to help out on their red routes. After this diaspora this first batch were to be found all over the Home Counties, wherever Cadet populations were in need of support. 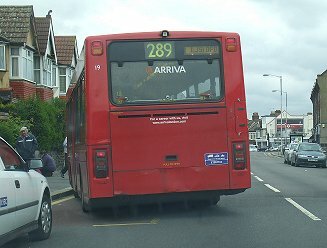 Most of the Croydon buses moved to Thornton Heath in March 2009, for the 289 and 255. The others were all over. Some spent time with Arriva Southern Counties or Arriva the Shires, DWL15 and DWL17-22 being taken on permanently by the latter in late 2012, at Hemel Hempstead or Wycombe. These lost their centre doorways and red livery. They lasted well, all putting in their ten, and only DWL14 succumbing by the time of writing. Those at Thornton Heath succumbed in September/October 2015, going into store at Barking or Norwood until sale to Lister in spring 2016. The second batch of DWLs was not an unalloyed success, to put it mildly. Slightly longer, at 10.8m, they were also an early EuroIII bus, with a Cummins ISBe 4-cylinder Euro III engine. This suffered electronic control problems, which made the batch chronically unreliable. 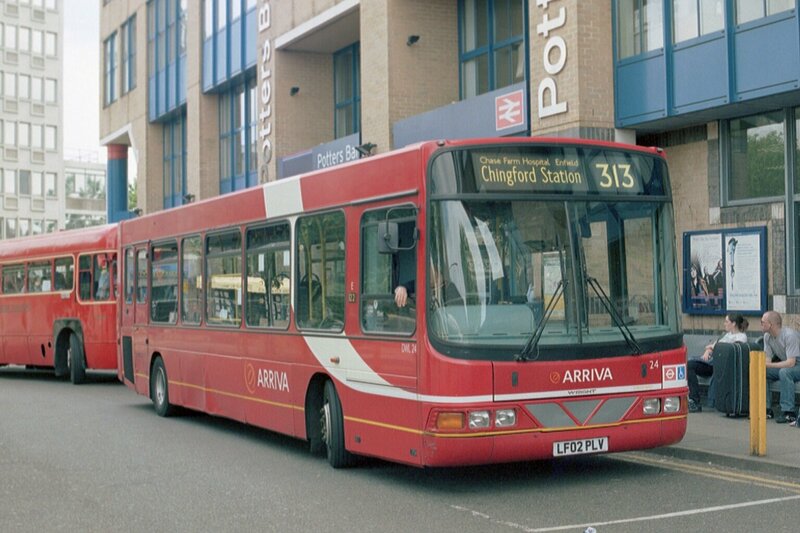 They all went to Enfield for the 313 (Potters Bar - Chingford Station), from April 2002. They stayed there, suffering availability figures regularly in the mid 60% region, and helped out perforce by other imported shorter DWLs and other types, including double-deckers. Most nevertheless survived until late 2011, with a couple falling by the wayside (literally). 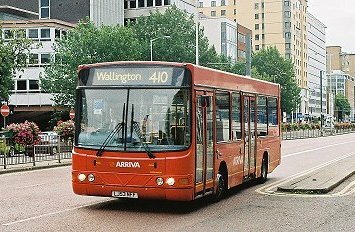 Then the survivors were sent off for refurbishment and went to Arriva Midlands. DWL24 at Potters Bar Station, western terminus of the 313 in June 2006. Note how in the Arriva London North area the shorthened identifier was just the number, on the dash. DWL26 heads out of Potters Bar towards Chingford Station in May 2007. 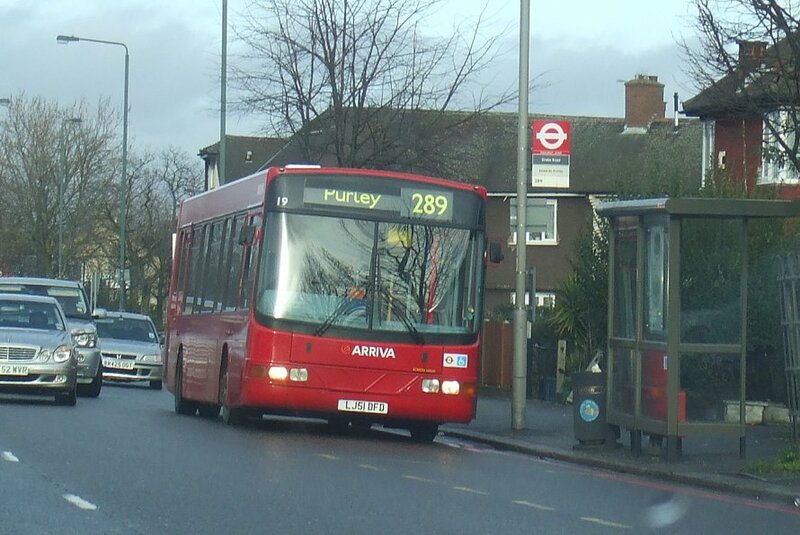 DWL39, from the third batch, is on the 298 south of Cockfosters, on the same day. The large third batch reverted to 10.2m length. Externally they differed in the engine grille arrangement and in a new style for the rear light clusters. They lost the silver element of the front W too. Still with Euro3 engines, they had a new engine management system that worked. 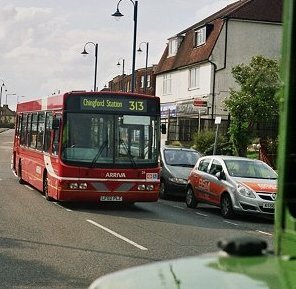 DWL30-55 were delivered to Wood Green between June and September 2002. Seventeen were needed daily for the 184 (Barnet Church - Turnpike Lane Station), on which they took over from long step entrance LDR Darts. Six more were needed by Wood Green for the 298 (Potters Bar - Arnos Grove Station), so with just three spares the DWL allocation was tight. Extras were acquired from late 2006, when some of the first batch came from Brixton. So when the driving test regulations changed in 2007, requiring the test vehicles to be fitted with ABS braking, some of this batch were chosen to enter the driving trainer fleet. 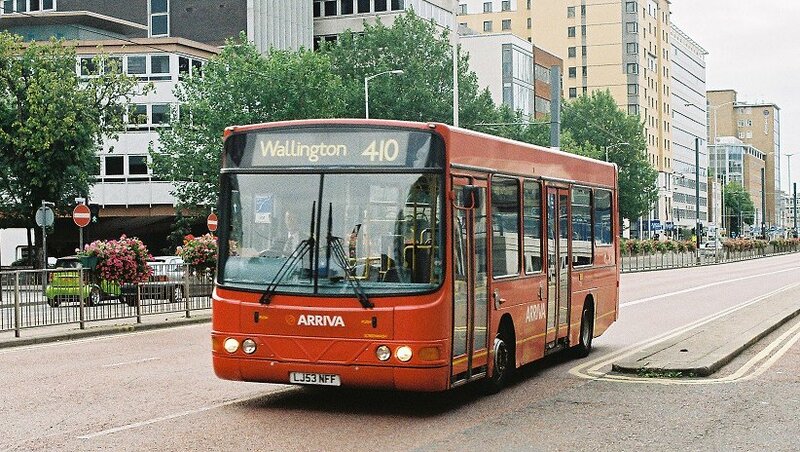 DWL30 - DWL41 were converted during 2007 and 2008, and were repainted in Arriva gym-slip livery of white with a grey skirt. The others at Wood Green were displaced by new E200 EnviroDarts in the summer of 2009, and went to Edmonton for use on the 444 (Chingford Station - Turnpike Lane Station). I spotted DWL41 in trainer livery at Edmonton garage as I walked past beside the River Lea in October 2009. They were still at Edmonton in March 2012, when Edmonton ceased operations in favour of the Lea Valley site across the river. But that site was compulsorily purchased by the National Grid, and in March 2014 the buses returned to the Edmonton riverside garage. They were withdrawn in June 2016 and were sent to Arriva Midlands for disposal. Arriva sent them back to London for storage at Norwood. DWL56 was a replacement for scrapped DWL14. It was delivered in March 2003, and went to Enfield. 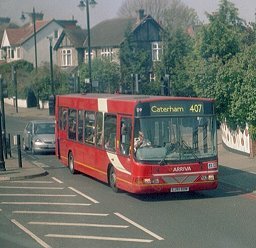 As a shorter bus than those normally on the 313, it was favourite for use on the 491 (North Middlesex Hospital - Waltham Cross) alongside PDL Darts. It later moved on to Wood Green. 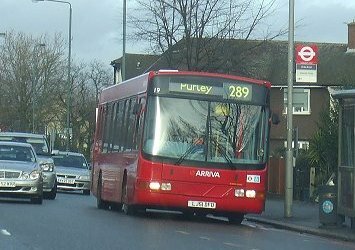 In 2012 it moved to Arriva Southern Counties at Dartford, and then to Arriva the Shires at Garston as a TfL spare. 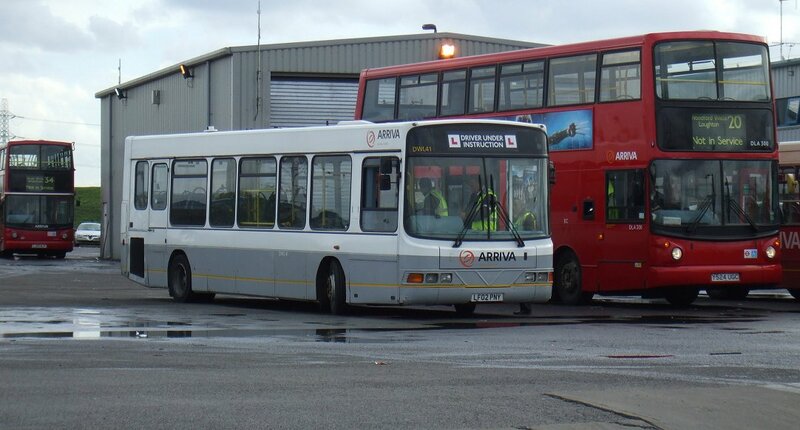 These eleven were ordered for Arriva London South at Beddington Farm, arriving in the summer and autumn of 2003. 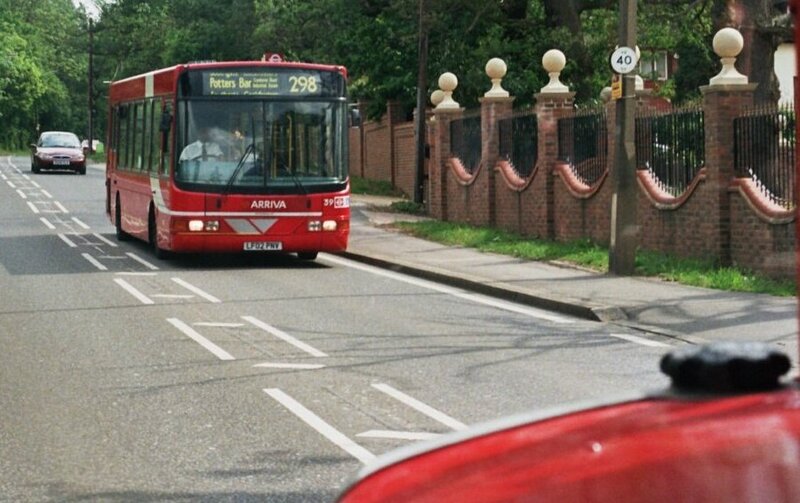 They were for route 455 (Wallington - Purley (Old Lodge Lane)), which they maintained until March 2012, when the route was taken over by Abellio. During this period DWL58 was fire-damaged and written off. 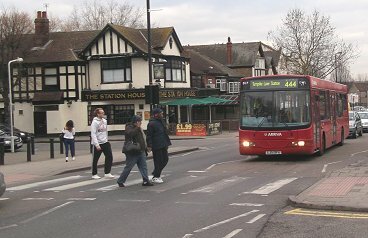 DWL65 at West Croydon on the 455 in May 2008. The remainder went into store, where they had their centre doorways removed, extra seats added, and their red livery replaced by blue and turquoise. They were then divided up between Arriva Southern Counties (mainly at Guildford) and Arriva the Shires at Garston (for non-TfL routes). Transport for London's 410 route ran from Wallington through Croydon to Crystal Palace. Between the last pair it did some estate penetration involving mini-roundabouts, so the 10m or longer buses were unsuitable. So when the rolling stock was updated at the end of 2003 shorter, 9.4m, two-doorway Cadets were ordered, which became DWS1-18. They operated from Beddington Farm (CN), where they stayed until the garage there ceased operations in March 2012. Then they moved to Thornton Heath, but stayed on the 410. DWS3 at East Croydon Station on the 410 in April 2010. 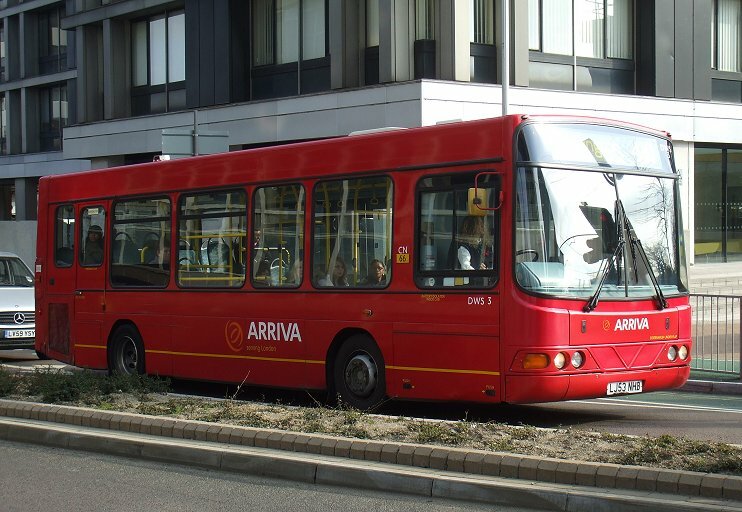 This is the intermediate livery, minus cow-horns but retaining the yellow cheat-line and the large Arriva fleetname. DWS17 approaches West Croydon Station on the 410 in September 2009. DWS4 rounds the coner across the tram tracks in Central Croydon. Thornton Heath's route 410 and 450 were supposed to receive new Streetlites in August 2016, but late delivery meant that the DWSs had a stay of execution: they moved with the 450 to Norwood for a month or two, before being sent to store at Edmonton.